Taghizadeh has an affinity for narrative and text. Many of her works make use of text in one form or another: The series The Missing works with newspaper columns about missing people; Rock, Paper, Scissors uses newspaper columns and dictionary entries; several of the series exhibited in Open Wiring bring in various forms of text as well, from book pages to newspapers to handwritten texts around images. She believes that, since memory does not separate images from words, there is no reason to shy away from using words when creating artworks. How do narrative/text and images work together in your creations? Which one do you start with and which one do you arrive at? How do you put them side by side? When we think about an event, a memory, or a period in our life, is it just words that rush to our mind or just images? They are all one woven piece; but in arts, literature, or whatever media we use for expression, we tend to separate them, differentiate them, or emphasize one over the other. In a way, such separation of the textual and the visual or even the musical follows constructs we have formed to organize the mind. But the mind does not work like that. It uses a combination of them to arrive at recognition. In my work, I have the same approach, even though in a certain series I might emphasize one aspect or another because I feel that might help with understanding the work. What is the role of language in your work? Is it just decorative, another visual element of the work? Or is it also a medium that allows you to express your thoughts on the subject and add more layers to the piece? Language is a medium. For me, language and text have never just been form, at least not yet; [and by form I mean] the approach that calligraphy in its traditional and modern sense has toward using language, robbing it of meaning and bringing it down only to form. Unfortunately, this happens more to non-European languages, languages such as Persian, Arabic, and those of the Far East. They become devoid of meaning and are turned into exotic forms. I have so far really tried to avoid this. I use language to document narratives, and, moreover, I try to use it in a way that reflects the qualities of those narratives. When you work with texts, you manipulate them. This manipulation is, in a way, an invasion of the narrative, a free translation of it, or a new reading of it. In the process, what thematic and visual concerns do you have? Texts sometimes have the function of documenting, even though nothing is ever completely documentary, since there is always the subjectivity of the documentarian. Consider history: Who has written history? The scribe of the victorious ruling power. Who has written the history of oppression? The victim who brings the trauma into every aspect of the narrative. Even the videos of security cameras are not fair and objective witnesses, because the position of the camera has been dictated by the proprietor and the power that demands its installation. Objectivity is totally meaningless, even in documentary images and photojournalism. In each narrative, images, words, sounds, and feelings move side by side in a parallel and come together to form a collective whole, embedded in some historical and social background. It is these parallels that I look for in documentary texts: places in the narrative that are conceptually familiar to me or are parallel to a part of my memory. I locate myself amidst those parallel lines and excavate my own narrative from them. I look to see which part of that narrative hooks me and I make it mine. I use texts by others in order to say what I want to say, or I use them metaphorically. This is what I did with Dalal Mughrabi and her narrative. The newspapers I have put in the showcase all speak of that event, but each presents its own perspective. One calls Mughrabi a martyr and the other a terrorist. In Nizar Qabbani’s work, Mughrabi’s narrative turns into a poem, with lyrical and epic quality. Faced with these, I stand to the side to see what draws me in, and I learn that for me it is her four-hour struggle for something impossible, for the building of a democratic republic. That victorious failure is familiar to me. I have experienced it. The parallel lines of memory take me to Tehran’s Azadi Street on the 15th of June 2009, walking with the residents of the city in total silence. That, too, was an attempt for the impossible, but the attempt itself was as important as any outcome. The attempt in Tehran ended in violence as well. The narratives about that day are dual or multiple as well. Were the people in the streets reformers and freedom-seekers, or were they thugs disturbing public peace? How did the media report on this? From whose perspective? From all the parallel lines that formed the whole of this interwoven story, which one did they follow? 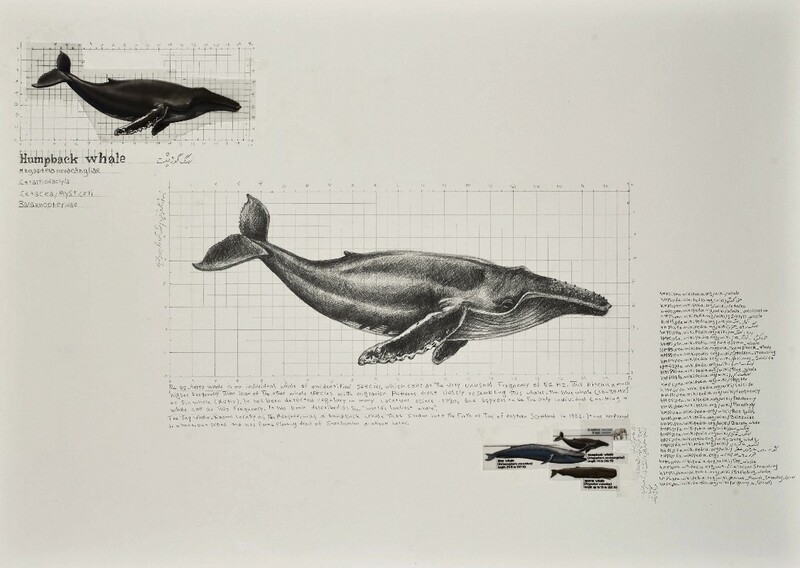 In the case of the drawings of the 52-hertz whale, I realize that the information about a whale in far-away oceans is telling me a similar story: that of a whale whose voice is in a frequency different from that of other whales and it cannot thus be heard. In the case of works in the Anatomy Book series, I draw everyday objects over the pages of the books. I want to define certain forms of relationship with our bodies and the physicality of the objects. Meanwhile, I add mental notes and poems on the sides, which I then erase with white correction fluid. I want to keep the materiality of things and erase the immateriality and leave it out of what I share with my audience. It is as such that I bring together documents and information—that abound these days and can be easily accessible—sit with the parallel lines in front of me, and attempt to weave out of them a new texture. I think the same is true about texts other than documentaries, for example, literature and poetry. Which part of our soul does poetry bond with other than with our human life experience? This is why we continue to read poems of Sa’di and Rumi, Ahmad Shamloo and Octavio Paz, or Shakespeare or Milan Kundera; and in every reading we find and understand new things, because we keep finding more lines of shared social, personal, and interior experiences within them. Ezzat Ebrahimnejad, whose poetry reading I present in a video installation, recites these lines, “Remember us / We were twenty-so-year-old youth / We had the passion of love in our hearts and before we could fall in love, we died.” A few steps from the video, I present works in which I have drawn switches over copies of pages from a book that includes the political prison letters Ali-Asghar Haj Seyed Javadi wrote before the Islamic Revolution. These are related to the works I did on the newspapers of the time and to the dog drawings. In these letters, Seyyed Javadi writes of the lost cause and passion, of which the young Ebrahimnejad would speak of years later and lose his life for, and which Nizar Qabbani wrote in his poetry about. Each in and for his own time, in his own language. Another work in the exhibition is a video of my performance “Reading Titus Andronicus,” which is a recording of me reading Shakespeare’s play in the streets of Tehran. I, the reader, wear a GoPro camera on my head and record the images and sounds. What does Shakespeare’s play have for me today in Tehran and how do I get connected with it? How do I recognize my social life experience and myself within the play? These are the kind of things I excavate from the texts I use. In several of your series (The Missing; Rock, Paper, Scissors; and some of the series in the Open Wiring exhibition) you work with newspaper as a specific form of text. You once said that newspapers “have been my conceptual and visual concern for many years.” Why newspapers? Can you tell us more about this concern? I was seven years old and just beginning to learn to read and write at the time of the Islamic Revolution of 1977. In the chaos of those days, newspapers ran several prints every day, they were everywhere, and went from hand to hand. The adults reading newspapers and trying to figure out what was going on in the streets ran parallel to the kids learning the alphabet and reading textbooks. Everyone seemed to sense they were at a historical moment. Adults archived newspaper clippings in folders and notebooks and mounted them on community boards. For the seven-year-old me the newspapers were both text and image. The alphabet letters were in the beginning just form, but over the course of the days and weeks they turned into meanings that could be discovered. In a way, for a kid whose adults didn’t have the time to explain to her what was going on around her, newspapers were more at hand than storybooks. Later on, my college years coincided with the period in the 1990s during Mohammad Khatami’s presidency that came to be known as the “Spring of Journalism” in Iranian history, when every other day a newspaper was born or shut down. The headlines of Salam daily led to it being shut down and that in turn led to the disastrous attacks to the Tehran University dormitory and campus and the suppression of the student movement. Once again, it was in the parallel lines of newspaper columns, in the weavings of image and text, that the ideals and wishes and desires of a generation were recorded and shaped. When working with newspapers, you make various aesthetic choices. For example, in the drawings of the dog, you mirror the text and fade it. It is as if the words become ghosts in the background. One might think of them as just that, a presence in the background, or one might actually be prompted to think that they matter more than the drawings over them. Or in The Lost and in Rock, Paper, and Scissors, you use the collage method. What leads you to these choices? In Rock, Paper, Scissors, I used lenticular printing. The technique allowed me to make use of the optical illusion that happens as a result of the parallel lines over the surface. They cause the image to transform when you change your position in front of it. When the viewer moves in front of the works in the series, sometimes it is the headlines that change and sometimes it is the journalistic photographs that get replaced with images from art history. The parallel lines on the plastic surface push the viewer to move and shift his/her position in order to be able to fully see the work. He/she needs to be restless and to constantly move, since the images and texts do not change with tiny movements. Moreover, I replaced the actual text of the newspaper columns with those from a dictionary. I took the keywords in those columns and replaced them with the dictionary entries for the words and with their synonyms. But I also wanted to make sure that I have the familiar imagery of the newspapers from the Revolution time and their revolutionary headlines there on the surface of the work, since these images are still mounted around the city to mark the anniversary of the Islamic Revolution. In the Open Wiring exhibition, I worked with more recent newspapers, those from July 1999 and its following months. I used chemical materials to transmit the newspaper texts to paper, mirroring and fading them. These are newspapers that, unlike the previous ones, are not publicly displayed. They are related to the student movement and the University of Tehran events that are denied by the regime and pushed to the margins. They are supposed to be forgotten and they barely survive in our collective memory. These events turned the lives of a generation upside down and narrate the multilayered suppression of intellectuals of a generation, but they are disappearing from our collective memories. Like the rest of the works in this exhibition, they are all stories of suppression and failure. That is why the images and words of these newspapers are faded, as if only a trace of them has remained over the years. And on them, I drew images of a dog because I read recently about a dog—dogs—in Greece who always sided with the protestors, not with the police. Following their instincts and feelings, they know whom they should side with. As a young university student, lacking any political perspective or logical understanding of the situation of the time, I, too, understood whose side I had to take only by following my instincts and feelings. You consider your exhibition Open Wiring, a “mind map.” You have said that, by putting these seemingly different series in one exhibit, you wanted to present your audience with “your way of thinking.” This reminds me of something else you said in another context, “The doing itself was actually the goal, the result, in and of itself.” It seems that here, too, it is not the works that matter the most, but rather the journey into your mental labyrinth; that we are invited to focus not on the product, but on the mental and social process of the artist, of those represented in the works, and of ourselves as audience. Exactly. In each and every work in this exhibit I deal with endeavors and narratives for which the results were less important than the path taken. Perhaps this inclination toward process, instead of outcome, is a result of my way of life in a situation where nothing comes to fruitionand everything seems like a failure. The obsession with outcome and results is what has caused serious problems in our society as a whole, in our politics, and in smaller contexts such as the art world. The “open wiring” system itself, as a fast and cheap way to conduct electricity, is a metaphor for this condition. In a long-term process, we “might” get results and change “might” happen, but this does not comply with the concept of “success” forced upon us from every direction, a key concept of the neoliberal society that hides its problems behind the various brands it creates out of success. For an artist taken amidst economical problems, censorship, and various social and political issues, two paths remain: either aligning with conditions that promise fast reachable success while coming to terms with a system that devours him/her; or rather standing at a distance and choosing a quieter path, attempting to construct and build things little by little throughout that path. This constant challenge for every decision and action, big or small, troubles the mind and fills it with questions. These are the things I have tried to show in these works. In these works, we travel to present-day Tehran, Tehran prior to the 2009 presidential election, Tehran after the 1953 coup d’état, the Palestine of 1978, present-day Greece, the imaginary times and places of memorable films, the world underwater, etc. The exhibition seems to become a wiring of different countries in different historical moments, connecting the symbols, concerns, and struggles of their peoples, in general, and, more specifically, their political activists and artists. We are reminded that the contemporary artist, or anyone who contemplates the world, needs to extend beyond his/her country’s borders into a larger spatial, geographical, and mental expanse, an expansion that might even happen unconsciously. What is the significance of these connections to you? You make great observations. Contemporary people, their concerns and thoughts, their wishes and desires, do not belong to a certain time and place anymore. This is true about me as well. We don’t anymore read the local newspaper while having our breakfast. Instead, we scroll on the newsfeed on our laptops. Images of a boat of Syrian refugees, that of a man hanging himself from Mirdamad Bridge in Tehran, that of a group wedding in North Korea, and that of President Obama dancing in Cuba, they all come together in our mind. While geographical borders are still one of the main issues of our world and the fight for soil and water is the source of many of the wars and miseries around the world, in the virtual world these borders are completely erased. Medias and disciplines have merged too. I believe this is the way a contemporary person thinks and engages with the world. It is imperative to make historical experiences tangible and understand one’s situation in a historical, cultural, and social context. Thought does not form in a void, and neither does art. I see the works in the Open Wiring exhibition as political art. But they are not art that suffers political propaganda; rather, they engage critically with the world around them, and this is what makes them political. They are artworks that ask questions and force us to ask questions. What do you think about the significance of initiating critical conversations with your art? I don’t think about this consciously. This is just the way I live. Every little thing I do, from buying something to resting somewhere to deciding to do something, inherently involves such engagement, sometimes even without me having to talk about it as such. There is no separation between my everyday life and my critical approach. And so my art, which is directly related to my individual and social way of life and its experiences, cannot be devoid of the critical conversation. There are many artists who use political and social concerns, for example environmental or human rights issues, as their raw material. They know such subject matters bring them attention and success, but they do not really engage with the issues. But I live with these concerns and thoughts. I breathe them and organize my everyday life around them. Doing environmental work or writing a critical piece about our urban space as a citizen is not for me distinct and separate from doing so as an artist. My artwork is a result of such perspective. Throughout history, art has narrated the lives of the people, their dreams, their failures and fears, their passions and loves, regardless of the history that has been penned by the victors. History is the space of macro-narratives and art is where micro-narratives, micro-histories, can come together and form a whole that stands in the face of or complements the macro-narrative of history. Our world is a complicated one and, I believe, it is only through such an approach to art that we can find and create our human condition within this complexity.